With the hustle and bustle of the holiday season, don’t forget to take a moment and say thank you. 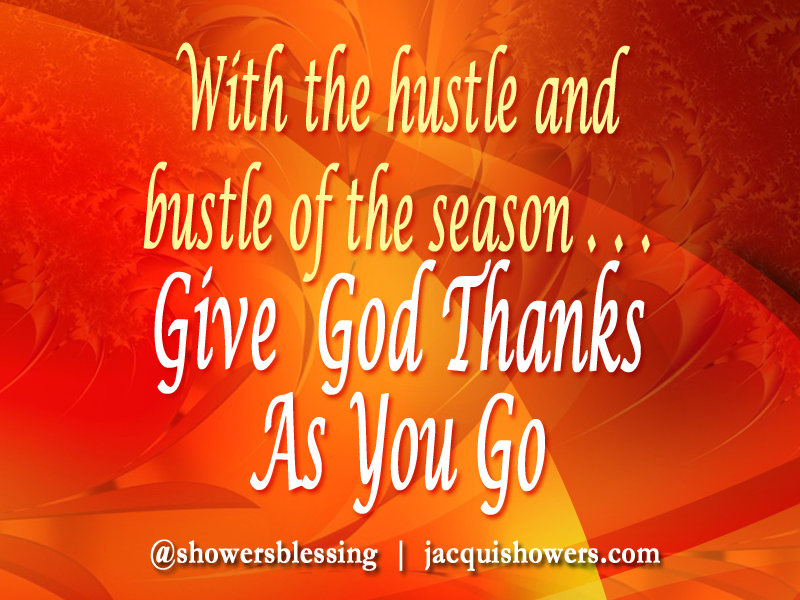 We become so caught up with the busy-ness of the season we sometimes forget to stop and say thank you. Thankfulness is a process. In the hustle and bustle of the holiday and when it seems as though everything is going against you, remember it is just a process to manifestation. You’ve already been delivered and healed. Your loved ones are already saved. You already have more than enough. Praise the Father and give God thanks for the process to manifestation. It is the processes in our journey that brings us to our purpose. The most important thing to be thankful for is God’s love and grace. It is because of His love and grace we are alive to celebrate yet another Thanksgiving Day. If we are here, it means we still have the capacity to fulfill our potential, walk in our purpose and live our dreams. My prayer for each of you is that you will have a Happy Thanksgiving as you keep God at the center of your holiday celebration.